Why were the stone paths created? 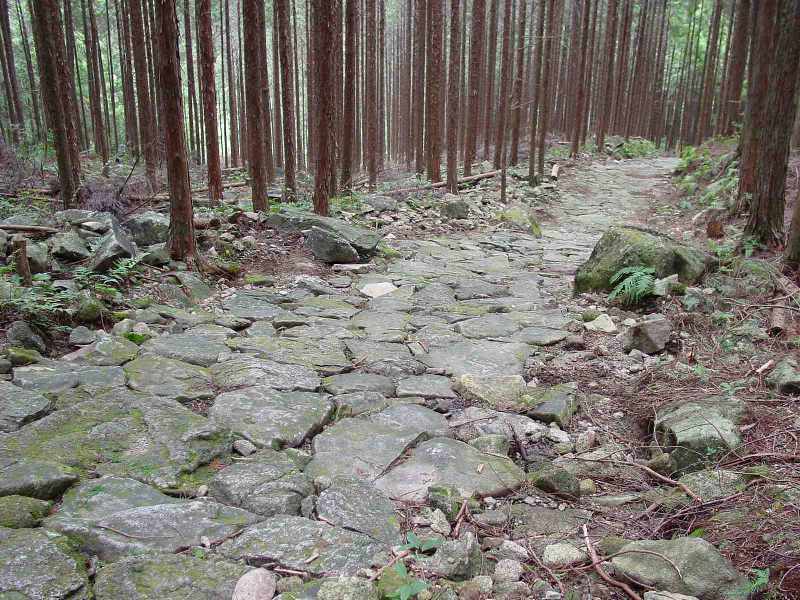 The stone paths are the icon of Kumano Kodo, but why were they created? 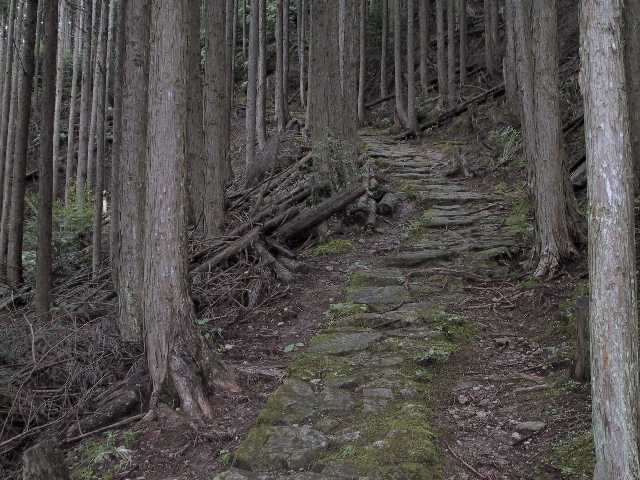 As you can see by walking along Kumano Kodo, it's extremely difficult to make stone paths since they are located on the mountain slopes.There must have been some reasons why they had to be created. The area of Higashikishu is in famous in Japan for heavy rain . It rains very hard in certain seasons. 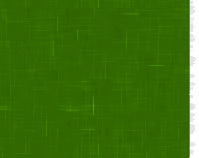 The earth paths would be washed away and destroyed by the rain. It's considered that the stone paths were created to protect the trails. The stones are laid without any gaps to improve the paths' strength. Still, the stone paths won't last forever. Since they were used as roads for people's lives until the beginning of the Showa period, they used to be repaired when they broke. The differences in dates may be seen in the different methods of construction. 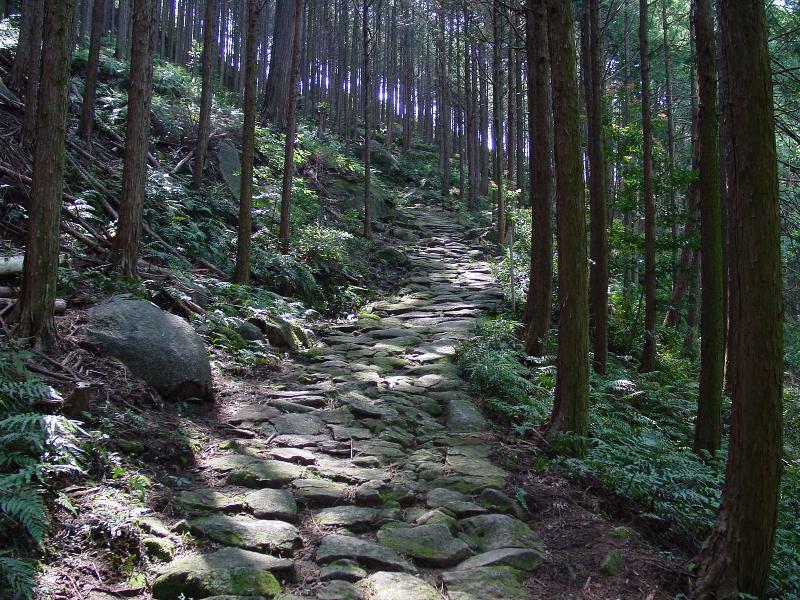 Kumano Kodo are rugged paths going over many mountain passes, so the incline is rather hard. It's also considered that the stone paths were created to make walking easier. By digging meters into the ground, the plane (Horiwari) was made and the stones were laid to make the incline milder. Also some people used to pass by palanquin a long time ago, and it was not possible for them to get over steep slopes. This is one reason why you can't find any stone paths on flat roads, but see stone fences reinforcing the shoulders on the valley sides. Since the climate is mild, the earth paths can become overgrown with grasses. The stone paths prevent the weeds regardless if walkers pass there or not. This is another reason why the stones are laid without any gaps. How were the stone paths made? The stones on the paths are densely packed. It's easy to imagine how difficult they were to make. So, how exactly were they made? You'll see the roads are lower than the slopes around them. There are some roads even meters lower . It shows that people dug ditches to a certain depth along the paths, and laid suitable flat stones on the firm foundation . There are some roads which are the same height as the slopes or step formations. Thus, the methods of construction are different depending on each place . However, it's considered that the basic construction, (digging and laying stones),is almost the same. in shapes are related to the area and time they were created in. Along flat spans, the stones were laid from the bottom up, with successively higher levels braced against underlying stones. The lack of gaps increases the strength of the paths. 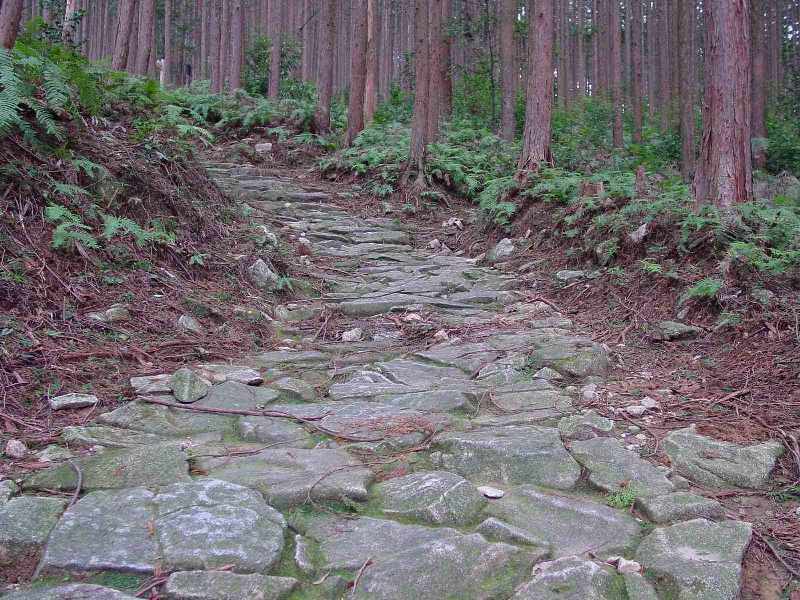 It's considered that most of the stones for the paths were procured in the local region. 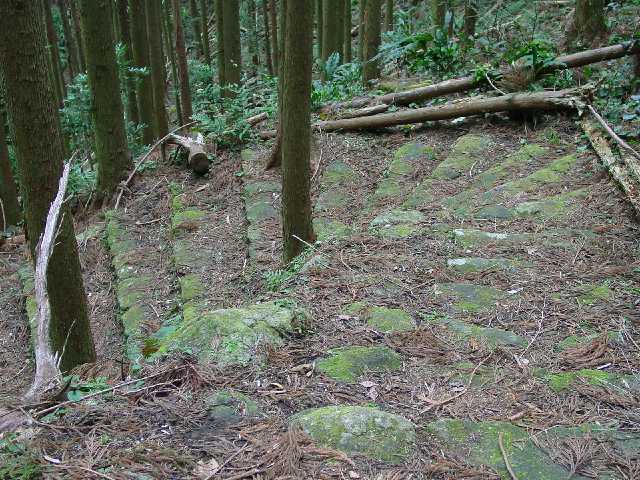 Kumano Acid Rocks ( Kurounmokaogan ) are generally used, which are usually found in the mountains of Higashikishu. Perhaps the stones scattered around the roads were used. It's said that you can find these stones most likely in the mountains dozens of meters away from the paths, the stones nearby the roads were used. Since not all stone paths were made in this way. The slashed part shows the mountain ground. The stone path will be made on this slope. l Lay the stones for the foundation. l Spread soil (or similar) on the stones to make the foundation firm. l Lay flat stones on the foundation. To brace the upper stones firmly, lay stones from the bottom up. The stone path will be a little lower than the original ground. When were the stone paths made? It's hard to tell when the stone paths were made. 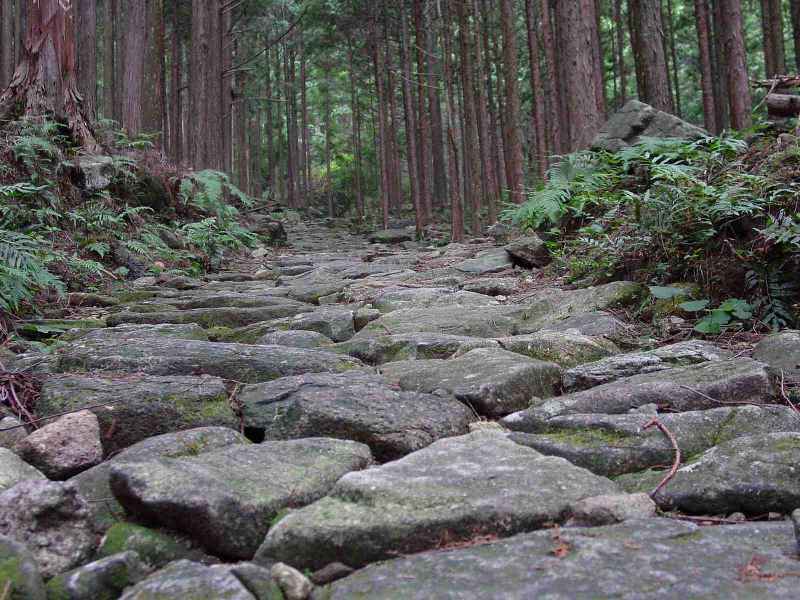 When the dedicated maintenance of the Kumano Kodo paths began at the first half of the 17th century, the stone paths already existed. Though the paths have been repaired many times since they were created, they are still maintained today. However, since the ancient process has been lost, it's difficult to restore them as they were. It's also hard to tell the differences of each section, as they derive from the skills of residents of each area or each time period. There are channels of running springwater from the mountain to the valley rivers which cross the roads. This method is called "Araikoshi"(washing over), and is seen anywhere along Kumano Kodo , not always on stone paths. Each cannel is small , but many can be seen along the roads. 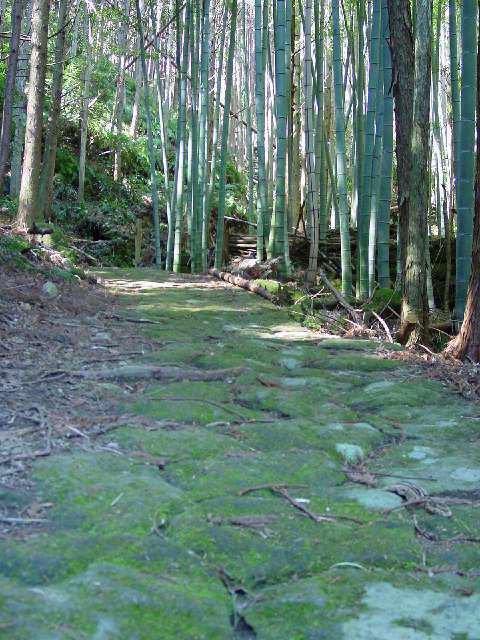 Since Kodo paths weren't used for a long time, most of them were covered over with soil, however they have been renewed since the recent discovery.